Skeletons of the Sahara re-aired June 8, 2016. 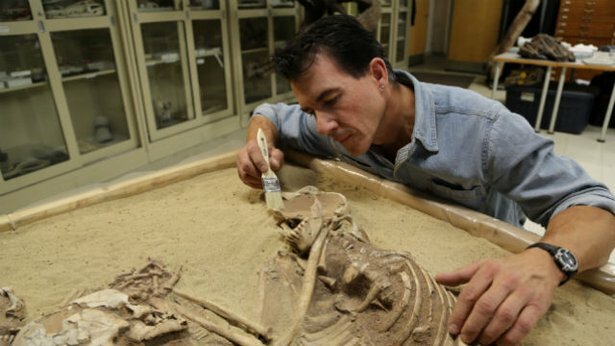 Travel to the Sahara with scientist Paul Sereno to excavate an ancient human cemetery. Like many great scientific discoveries, this one happened by accident. Paul Sereno, an expert in locating dinosaur fossils, was on an expedition to Niger in Saharan Africa. Six weeks into a three-month journey, his team made an unexpected discovery: human bones, the remains of peoples who lived 10,000 and 5,000 years ago. Sereno’s team counted dozens of skeletons within just a few minutes. Skeletons of the Sahara relates the story of this stunning find and what it reveals about two civilizations that once flourished in what is now the world’s largest desert. Skeletons of the Sahara joins Sereno on a return trip to Niger. After years of waiting for conflict in West Africa to stabilize, he finally returns to the area called “Gobero.” Over 10 years and five expeditions, Sereno has found more than 200 burial plots, each more intriguing than the last: a man buried with his head in a pot; another buried sitting in a turtle shell; a girl with a bracelet carved from hippo bone; and most striking of all, a woman embracing two children, hands entwined in a triple burial. Adding to the intrigue is the fact that the bones are from two separate civilizations, Kiffian and Tenerian, thousands of years apart, yet the dead were buried side by side. Scattered throughout the site, artifacts offer clues to the lives they led — arrowheads, intricate jewelry and, perhaps most surprising of all, harpoons carved from bone. Sereno brings the skeletons back to his lab intact in order to learn from their unique burial positions. But removing bones from the ground is something he has done only with dinosaur fossils. Collecting delicate human remains in shifting sand and transporting them thousands of miles is a risky procedure. Using their dinosaur excavating experience, his team digs around each of the skeletons, wraps them in jackets of plaster and sends them on their long journey to Chicago. In the lab, a team of experts awaits the delivery, eager to crack open the jackets and examine what lies inside. They carefully study the bones, teeth and burial positions — each new find becoming a precious puzzle piece as the experts reconstruct a vanished culture and bring new insight to our shared human story. Skeletons of the Sahara was produced by National Geographic Television in association with Camera One Productions. © National Geographic Television in association with Camera One Productions. 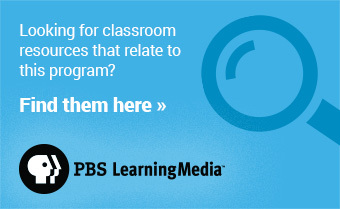 Major funding was provided by the Corporation for Public Broadcasting and PBS Viewers Like You.